From all different chemistries that theoretically could be used to design a flow battery, Elestor has selected hydrogen and bromine as active materials. This leads to several advantages. The choice for hydrogen and bromine is purely driven by Elestor’s mission to build a storage system with the lowest possible storage costs per kWh. While taking full advantage of the typical flow battery features, this mission cannot be accomplished without an inexpensive chemistry. 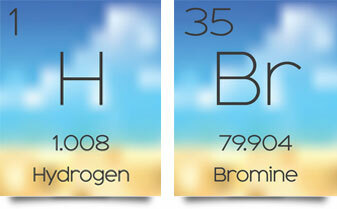 Hydrogen and bromine are abundantly available on a global scale. The supply is not restricted to geographical availability, and cannot be dominated by a small group of suppliers (unlike Lithium, Cobalt and Vanadium). The above factors add up to very low-priced active materials. Not only for today, but for decades to come, when large volumes are required for high volume production of hydrogen bromine flow batteries. Another advantage of selecting hydrogen and bromine is that these enable a high power density [W/m2] as well as a high energy density [kWh/m3], both contributing to the reduction of storage costs per kWh. The heart of all Elestor’s storage systems is the cell stack. This stack consists of a number of individual electrochemical cells as shown above, connected in series. Each membrane in this stack is on one side in contact with the electrolyte circuit, an aqueous solution of HBr and Br2, and on the other side with a hydrogen (H2) gas circuit. Both active materials circulate in a closed loop along their own respective side of the cell. 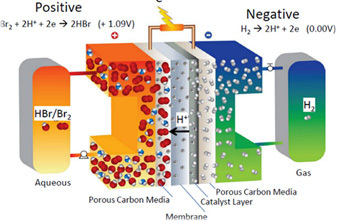 The electrolyte (HBr/Br2 solution) and hydrogen (H2) circuits are separated by a proton-conductive membrane. 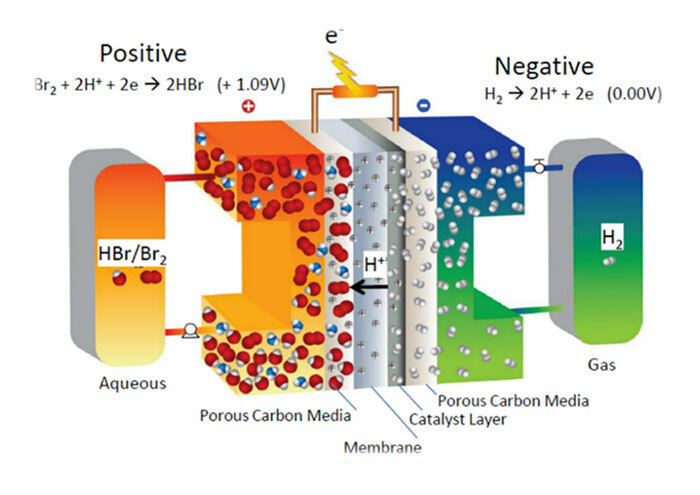 The fundamental working principle of a hydrogen bromine flow battery bears a high resemblance to the hydrogen oxygen fuel cell, which was invented in 1842 by the British Sir William Robert Grove. By using bromine instead of the less reactive oxygen, the charge and discharge efficiencies rise from 60% to 90% (or even higher). In this way, Elestor’s cell combines 2 electrochemical processes with 1 single membrane: The cell operates as an electrolyser during charge and as a fuel cell during discharge. The H+ ion crosses the membrane, absorbs an electron to form hydrogen (H2). The Br– ion remains in the electrolyte reservoir and releases an electron to form Br2, which dissolves in the electrolyte fluid. The H2 molecule releases 2 electrons and forms 2 H+ ions (protons). These protons cross the membrane and form HBr in the electrolyte circuit. Nothing goes in or out… except electricity! Since the chemical reaction of Elestor’s storage systems is 100% reversible, its storage capacity [kWh] remains unchanged during the lifetime. While (dis)charging, the active materials are only used, not consumed, and in fact only the chemical composition of the electrolyte reservoir and the pressure of the hydrogen tank changes during the (dis)charge process. The chemicals remain in the system without the need for human intervention, inherently ruling out risks related to human error if handled improperly. Elestor’s storage systems are 100% self-contained, and nothing goes in our out… except electricity! The system does not require a H2 compressor to generate pressure during charging. A H2 compressor is costly, consumes electrical energy and requires maintenance. The Elestor cells are designed in such a way that, up to a certain level, pressure can be built up without a separate H2 compressor. Based on a well-considered design, the Elestor stacks are simple yet robust. The stacks are easy to manufacture and already in the design phase, high production volumes are anticipated. With Elestor’s patented stack design manufacturing costs are reduced, having an additional positive effect on the storage costs per kWh. The Elestor system design shows a much higher resemblance with a mechanical ‘machine’ rather than with a closed ‘battery pack’. All parts (stacks, circulation pumps, valves, control electronics etc.) are easily accessible. Therefore, these systems can always be serviced and upgraded, in contrary to the typical closed battery packs of traditional storage technologies. Furthermore, exchange of stacks after 10,000 cycles gives a system a full second life. This leads to an additional reduction of storage costs per kWh and bottom line to a further enhanced return on investment. One of the unique features of Elestor’s flow battery concept is that the heat, generated during the charge and discharge processes due to efficiency losses, can easily be made available for other purposes. This heat, with a temperature of 35 to 40 ‘C can simply be coupled out by incorporating a heat exchanger in the electrolyte circuit. 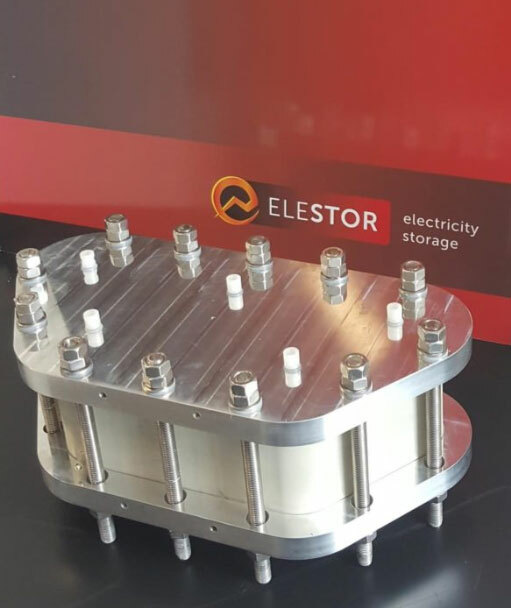 Instead of consuming energy to dissipate the heat, as is the case with traditional batteries, the heat from Elestor’s flow battery can be retreived to support industrial processes or heating systems in the built environment. 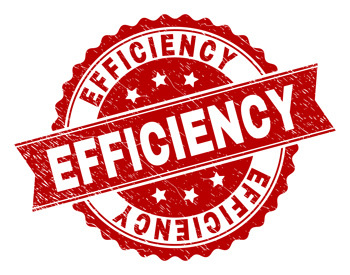 By recovering this energy, the overall efficiency of Elestor’s flow battery is significantly increased.